Electroluminescence is the phenomenon where light is emitted from a material in response to an electric current or field. This differs from incandescence, which is the emission of light due to heat; this is how conventional (non-fluorescent) light bulbs work. Light emitting diodes (LED) are actually a type of semiconductor that uses electroluminescence to generate light. First developed in 1927 by Oleg Losev, commercial LEDs have been available since the 1960s and were commonly found as calculator displays for scientific calculators. Semiconductors are usually crystalline or amorphous solids that come in two versions: n-type and p-type. The n-type semiconductor is doped with excess electrons by adding impurities like phosphorus to a silicon matrix. The p-type conductor is also silicon, but without the phosphorous. The two materials are sandwiched together with electrical leads; the anode (+) going to the p-type and the cathode (-) to the n-type. When a current is applied the excess electrons move from the n-type material to the ‘holes’ in the p-type material, resulting in the emission of light. Typical LEDs operate at low energies (30-60 milliwatts); Lumileds was able to arrange a collection of LEDs to produce a 5 watt bulb that generated 18-22 lumens of light; compared to conventional incandescent bulbs using 60-100 watts to emit 15 lumens of light. Interestingly, the LEDs experienced efficiency droop, which is the decrease in efficiency as more current is applied (>10 mA). LEDs at high currents will also heat up and diminish their lifespan. Increasing the efficiency and brightness of an LED is a struggle for the industry. Organic LEDs operate in the same manner as conventional LEDs except that the materials used are thin, layered films of organic plastic in place of a silicon crystal. The films can be 100 nm thick, making them durable, yet flexible. The dual natures of OLEDs make them extremely useful for mobile and handheld applications. There are drawbacks to OLEDs, the biggest being their lifespan. Colors like blue degrade quickly, which can affect color balance and OLED performance. The best way to address this problem is to make a more efficient OLED that maintains its brightness while using less power. There are a lot of species that produce bioluminescence, but the firefly is the most efficient. Also called the lightning bug, there are over 2000 species of firefly that can produce colors of yellow, green, or pale red. 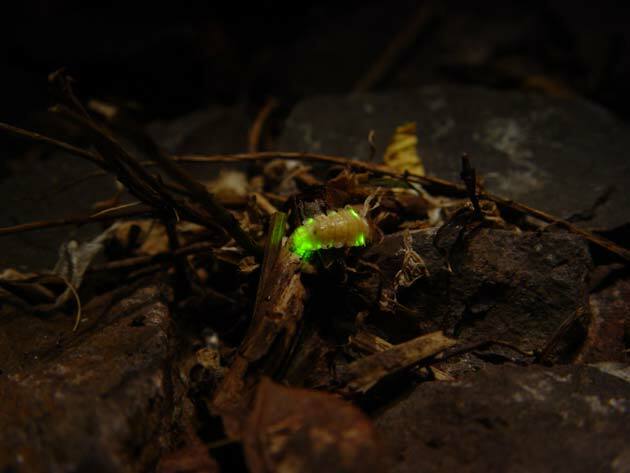 Even the larvae emit light and are called glowworms. 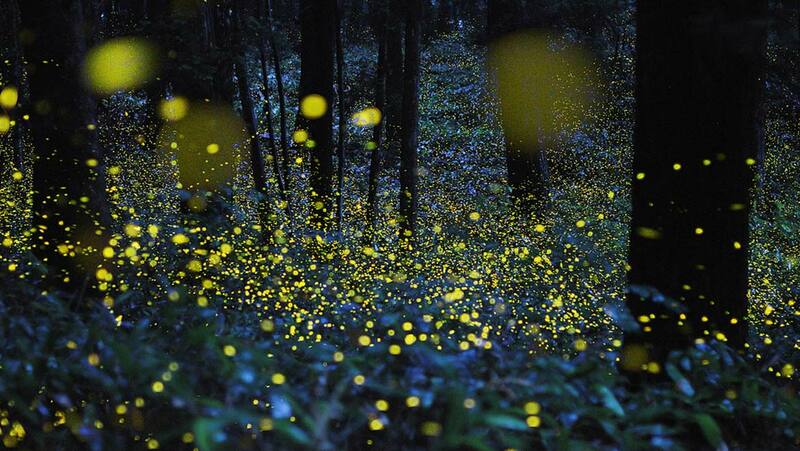 The fireflies produce light via a chemical reaction between the enzyme luciferase and luciferin. Fireflies demonstrate the largest quantum yield compared to jellyfish and ostracods. Scientists from the Korea Advanced Institute of Science and Technology (KAIST) investigated the nanostructures of firefly lantern cuticles to reveal nanostructures that improved photonic efficiency. The microstructures were arranged like roofing tiles; each tile was angled and each tile had a series of ridges along the transverse plane. This highly structured cuticle sits upon a photogenic layer that produces the bioluminescence, which sits on a dorsal layer that reflects light outward. The KAIST team, headed by Ki-Hun Jeong, developed a fabrication process to mimic the micro and nanostructures found in firefly cuticles. They started photolithography and molding to get the staggered tile microstructure and treated the mold to get the nanostructure ridges on the tiles. The mold was then re-cast with a UV-cured resin to give a bio-inspired artificial cuticle that was then overlaid on the OLED. The OLED also had a reflective aluminum backing to mimic the dorsal layer of the firefly. The result? The KAIST team’s OLEDs were more luminous than conventional OLEDs. The luminosity was dependent on the microstructure and by modifying the angles, the team could produce an OLED that was 60% brighter with the same power input. The OLED wasn’t producing more light per se, but less light was lost due to refractions. For fireflies, this translates to using less energy to produce more light, increasing the visibility that is necessary to attract a mate. For the OLED industry, increased light efficiency means longer-lasting OLEDs.